14mm long belly bars are quite hard to get hard of, but if you need a 14mm long belly bar then these are ideal. 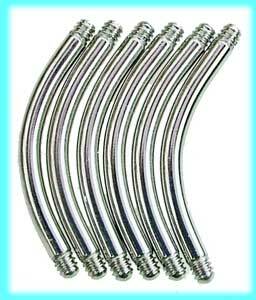 High grade 316L surgical steel and suitable for all of our range of UV glow and acrylic belly bars. All you have to do is unscrew the old bar and screw on the new one, but please don't over tighten the balls as they are acrylic and this is softer than surgical steel, so you may damage the threads on them. Powered by ShopFactory to sell P9532 online. All-in one eCommerce and online shopping cart software.